Waters from the Alumine River come from a lake call Alumine, situated on the Andes. This river runs throughout canyons and valleys from west to east until it meets with the Catan Lil River and both form the Collon Cura. This river has numerous tributaries such as Pulmari, Ruca Choroi, Quillen, and Malleo River, because of this reason it is a medium size river. 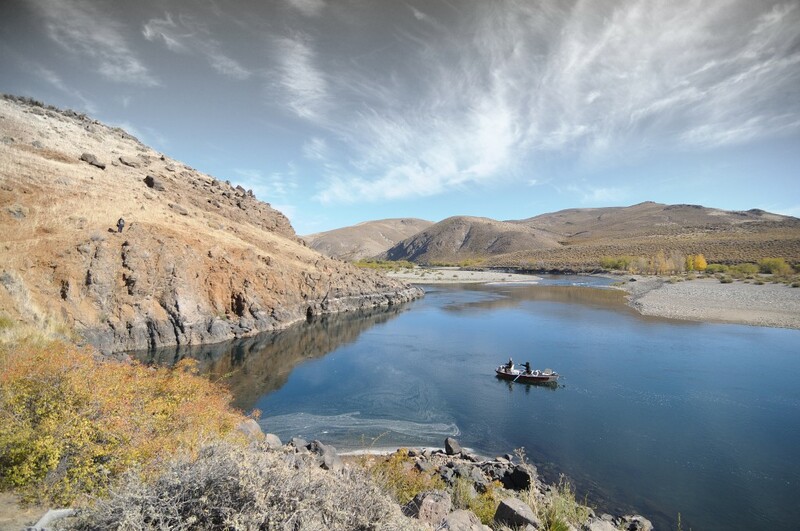 The first stretch of this river is well known for its great rafting waters, but not very much for the fishing. The best stretch for fly fishing is the lower Alumine. In this section floating trips of one two or three day are the best option for a successful fishing day. The lower Alumine flows from the confluence of the River Quillen to where the River Catan Lil enters. As tributaries flow into the Alumine, the river widens providing countless pools that become wider and deeper and the river changes color into a deep blue. This section is accessible from the river banks but with difficulty as the river flows limits access. However, as compensation the quality and quantity of fish caught is offset by the low fishing pressure and provides substantial satisfaction and excellent fishing. The first two thirds of this sections are totally inaccessible by automobile and it is necessary to use boats to float the river. When floating it is necessary two do it in two or three days, camping on the river side. The lack of access and low fishing pressure make this sector an exceptional and world class trout fishing portion of the river. Floating this part of the river will provide the angler with 30 to 40 rainbow and brown trout between 3 to 5 pounds and frequently trout between 6 to 8 pounds when using the proper equipment. The lack of access and low fishing pressure make this section an exceptional and world class fishing place. From a couple miles above the Malleo and Alumine confluence, it is possible to find fishing access, but floating still is the best option because allows the fisherman to cover more miles of water with better success of fishing. Last stretch is from the confluence of the Malleo and the Alumine river to the confluence of the Alumine and Catan Lil River, where it changes its name into Collon Cura. In this stretch river is a little wider, with some channel and fishing with dries, nymphs and streamers is really good. All the lower section of Alumine river has a variety of water, like riffles, pools, big boulders, runs, sharp banks and willows banks, allow fisherman of all kind of levels to catch fish. The amazing landscape in this remote area allows fisherman to experience the authentic Patagonia Argentina: canyons, valleys, fauna, condors, eagles, red deers, Mapuche people, and a complete river for yourself. As well as Collon Cura River, November is the time for streamers fishing and after that, dries and streamer techniques can be used. Numerous rainbows and brown trout live in this river. As well as other stretch, fish are very healthy and can give the fisherman a big fight.